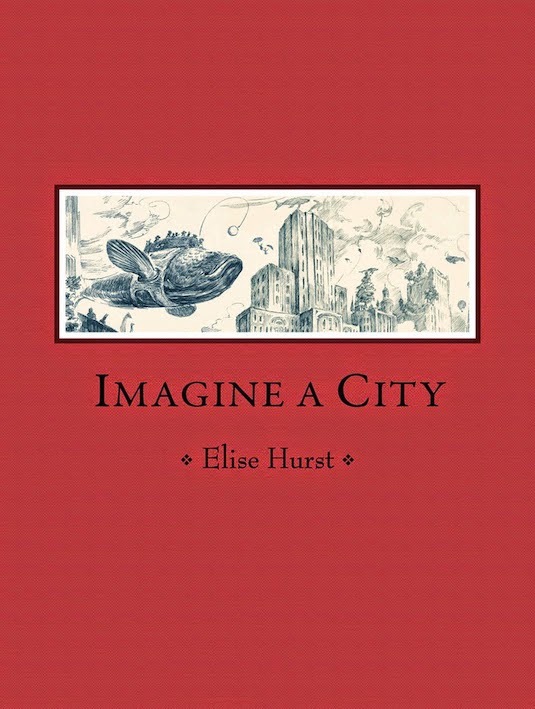 Imagine a City by Elise Hurst is a children’s picture book, published by Omnibus Books for Scholastic Australia in 2014. RRP: $Au24.99. Hurst invites us to imagine all sorts of things: trains to take us away, fantastical cities and worlds. She nudges us a step further to where buses are flying fish and treasures abound, to where the lines between past and present, reality and fantasy are blurred. All the while, the illustrations are detailed back and white sketches, somehow giving a matter-of-factness to the surreal. Kids will adore each page, poring over and remarking on the things they find. This is not only a children’s picture book, it’s a poem. Not the kind of poem that marches along, sweeping you up in its swing and sway, but a poem to ponder, one that prompts thoughts and dreams. I love it when authors give us picture books that are also poems as it helps very visual kids embrace poetry, perhaps for the first time. Do seek out Imagine a City. It would make a great model for children’s own explorations into imaginary worlds, whether in pictures, words or both. My copy is a sturdy hard back with red cloth cover and an inset illustration on the front. Perfect for your library or just to become a loved family favourite. There are excellent Teacher Notes available at the Scholastic website. Learn more about the book via this trailer. This one's a brilliant find, Susan; thanks for sharing it here. I hope you find and enjoy it, Richa!